COLUMBIA - Some home owners across the state aren’t allowed to display political signs on their property. However, a new House bill aims to change that. HB 1887 would prohibit property owners' associations from banning political signs on residents’ properties. Cheryl Thomas has lived in the Highland Lakes area in Columbia for 23 years. 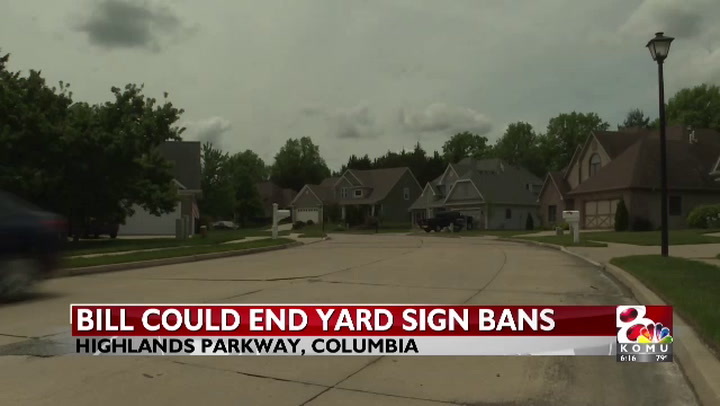 Political signs aren’t allowed there, and she said she hopes the bill changes the current ban by her homeowner's association. “There have been times where I would have liked to display signs in my yard. I would take advantage of this, if it passes," she said. Rep. Kurt Bahr, R-St. Charles, sponsored the bill. He said his bill boils down to First Amendment rights. “I found that as an abridgement of the free speech of my constituents who wanted to put up my sign or to support another candidate," Bahr said. "I thought that was an overreach on these political subdivisions to say you can’t have these yard signs." The bill has passed in both the House and Senate, and has been sent to the governor for signing. If signed in time, the bans could be lifted by the November elections this year.